When you adopt a star for a year you will receive a star chart of that variable star and a certificate showing the name of the person you specify. During the year, when a light curve for that star is created using the Light Curve Generator, your name or the name of the person you designate will appear on it. In addition, any star you adopt will also appear on the AAVSO Target Tool as a high priority target, giving your star more visibility. At the end of your year you will receive a light curve of the star. There is no limit to the number of variable stars a person can adopt (at $50.00 per star). We have created a simple web form that will handle the adoptions and donations. Click here to see a list of all the adopted stars and the donors who have adopted them. The stars will be listed alphabetically by constellation. 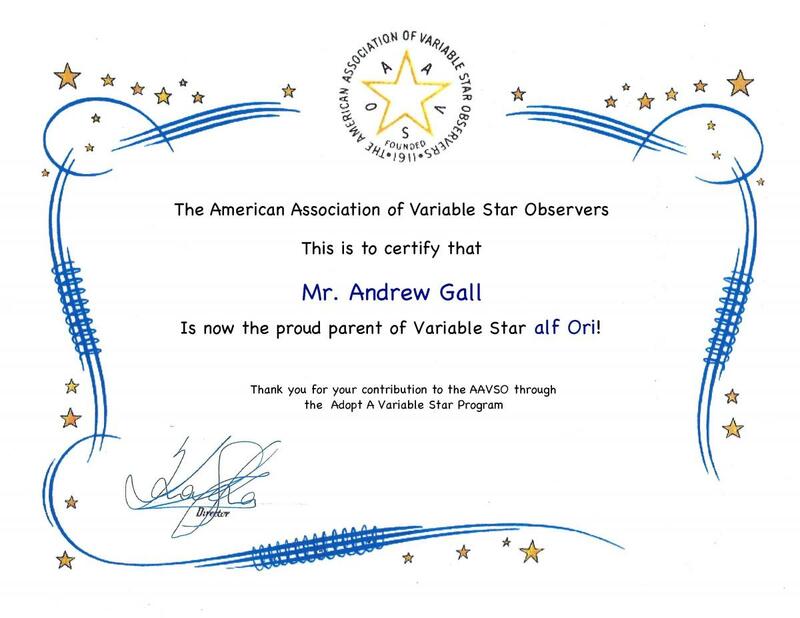 To be clear, you are not buying a star, you are not becoming the owner of anything pertaining to that star (except bragging rights), you are simply donating to the AAVSO in the name(s) of your favorite variable star(s). Adopt a variable star in celebration of a birthday, anniversary, wedding, graduation, promotion, retirement or other milestone! Adopted stars make excellent last-minute gifts. Click here to get started!